Canadia Tower has seen office rentals increase since it was confirmed as the initial home of the stock exchange. Canada Tower has benefited from the Cambodia stock exchange naming it as the bourse’s first home, an official said yesterday, with new clients including multinational giants drawn to the Phnom Penh skyscraper. Around 80 percent of office space available at the nation’s tallest building has now been rented, according to Pen Phyrun, marketing manager of Mega Asset Management Co, the property unit of tower owner Overseas Corporation Investment of Cambodia. This marks a rise on the 60 percent occupancy record in December, the same month that the Securities and Exchange Commission of Cambodia agreed to rent the tower’s 25th and 26th floor to temporarily house the exchange. “After the SECC came to our place, we got a lot of clients to rent here and we also has confirmed a lot of clients [wanting] to book the space,” he said, declining to reveal how long the contract is set to last. The bourse’s long-term home is touted to be in Camko City, Phnom Penh. “Our client came from local and international company such as Cambodia, the United Kingdom, Switzerland, Japan, USA, Australia and China,” he said. 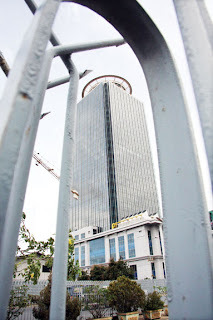 Among the firms which have signed contracts to move into the building are Sojitz Corporation from Japan, a construction consultant from the UK, British accountancy body ACCA Cooperation with Cambodian accountancy trainer CamEd, and French communications giant Alcatel-Lucent. The Bank of China is already stationed in the skyscraper. “We’re going to sign more contracts with our clients soon as they already confirmed to rent our place. “Our office space almost full, we hope that our place will full for next few months,” said Pen Phyrun. Canadia Tower, which opened in November 2009, has put 10,724 square metres of work space up for rent at around US$25 per square metre. Keuk Narin, general manger of the Bonna Realty Group and secretary of the National Valuers Association, said yesterday that Canadia Tower benefitted from its prime location and good pricing. “In only one year they can get clients [to rent] between 70-80 percent of their space - it is not a problem, they are successful,” he said. Canadia Tower is currently Phnom Penh’s only Grade A office space. But it is set to be joined by the Phnom Penh Tower which is scheduled to open next month in the capital. Of the14 Grade B buildings in the capital, occupancy lies at around 75 percent, according to the National Valuers Association. “In this year, we noted that occupancy rate increased because a lot of investors came here,” said Keuk Narin. Canadia Tower is also home to the headquarters of Canadia Bank.